Recently a disturbing trend has emerged. As the cost of college continues to spiral out of control, more and more parents are being targeted by con artists who are trying to fleece them by holding out the hope that they can get their student a scholarship. In fact, last year parents lost more than $100 million to these swindlers…over $250,000 a day…and that’s just what gets reported! Most authorities estimate that the real amount is four or five times more than what is listed. In fact, the Federal Trade Commission has had to form a special task force just to combat this, and their complaints were up an astonishing 586% from 2005 to 2006. 1. Beware of people who call you to tell you that you’ve won a scholarship (especially one that you didn’t apply for) and then want to ‘confirm’ your identity by getting your name, address, bank account numbers, social security information and stuff like that. All they’re trying to do is get enough information to steal your identity. 2. Watch out for high pressure. A friend with a teenage daughter told me the story of a company that called her relentlessly trying to get their checking account information so they could deposit her funds that she had ‘won’. The reality was that company was later charged with fraud for cleaning out people’s bank accounts. A real scholarship will usually notify you by mail or at an awards ceremony. 3. Also, don’t apply for any scholarship that requires you to pay an application fee. Many of these are simply lotteries. They charge thousands of parents fees that range from $10 to $249 to enter. Then, they give away ONE token scholarship to supposedly make everything legitimate, and pocket the rest. you’ve won. Like I mentioned in items number one and two, they’re often just trying to get your information to steal your identity. 5. Watch out for any company that ‘guarantees’ that you will win a scholarship. No one guarantee a scholarship except the organization that is offering it. So, most of these companies are simply giving you a book full of scholarships that everyone can apply for, and taking your money. By the time that you go to file a complaint, they are out of business. 6. Most scammers try to go out of their way to use official sounding names like ‘Federal’, ‘National’, ‘Education’, or ‘Foundation’ to try and fool you. And, don’t ask me why, but many of these companies tend to be headquartered in Florida. 7. 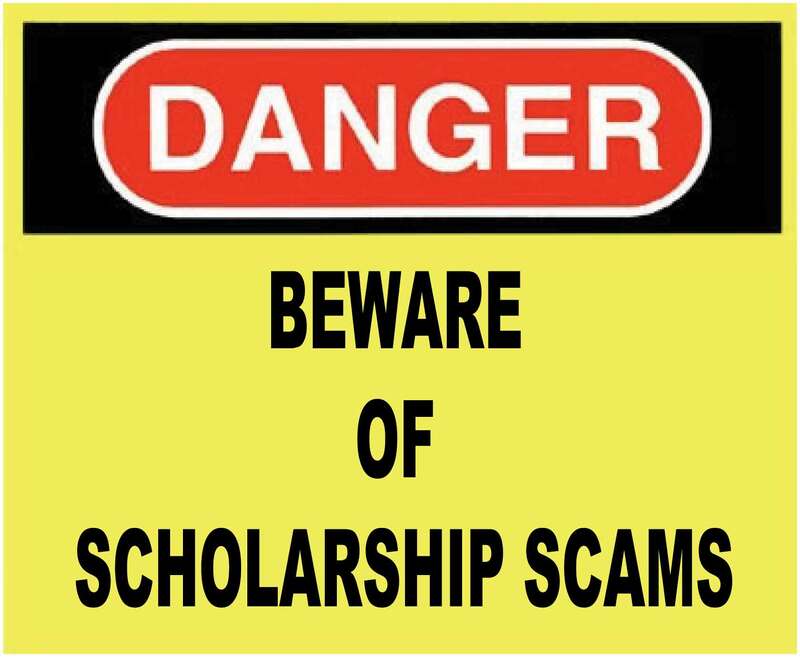 Last, if you are the victim of a scholarship scam, be sure to notify the FTC immediately. They will put you in touch with their education fraud division to assist you and remember, many of these companies will be out of business if you wait to complain. Hope these tips keep you safe. More in a few days…..